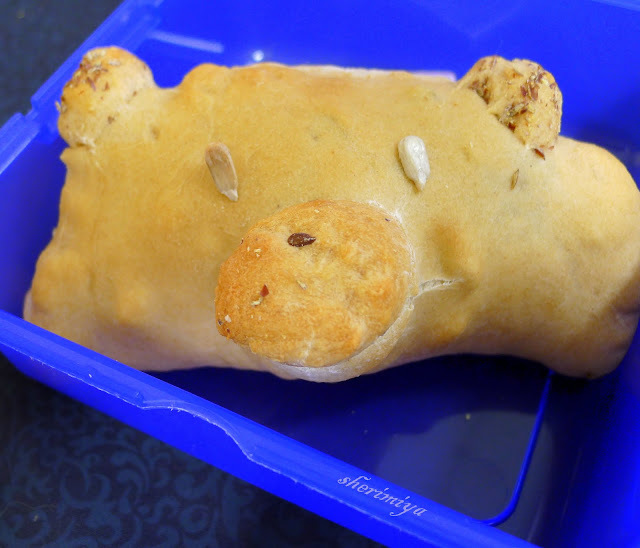 Piggy Calzone Bento, a photo by sherimiya ♥ on Flickr. I was so happy with the way my pizzas turned out, I decided to make calzones. I rolled the dough (use any pizza dough for this) out into circles, then placed chopped ham, pepperoni, grated cheese and baby arugula on half, and folded the circle in half, pinching to seal the edges together. For fun, I added two balls for ears (which I rolled in flaxmeal), and a little circle for a snout. I intended for it to result in a cute bear face, but the snout rose during baking and I think it looks more like a pig snout now. So a piggy it is. The calzone fits perfectly in one side of the Sistema box, while the other sectioned side contains: corn, broccoli, carrots, pluots, nectarines, grapes, strawberry and lychee. Oink! I love the piggy and the bright colors! That is way too adorable!! How awesome is this?! Great way to start the long weekend! So cute! I just did a "pig" bento not too long ago and was thinking of doing something similar with curry buns. ^^ Love it! This sounds so yummy and looks so cute:) How creative! Thanks a lot Genetta, Diana, Chantale, AikoVenus, and Terumi!! 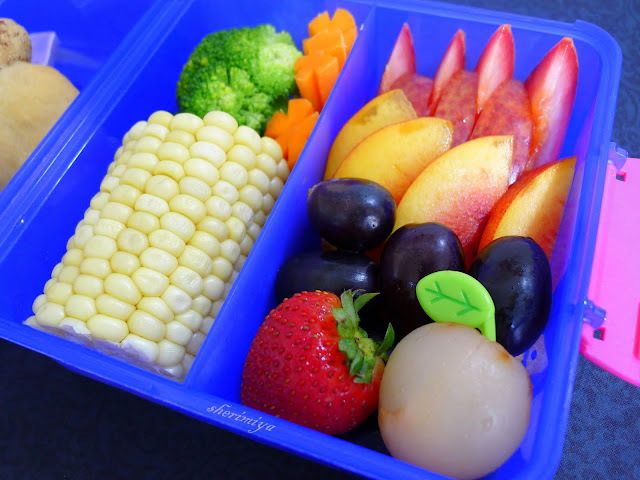 You cut fruit with such pretty finesse, they sparkle like sweet jewels in your bentos. Happy holiday weekend! So cute!! Am sure its very yummy too! You make me smile!!! This is so cute! 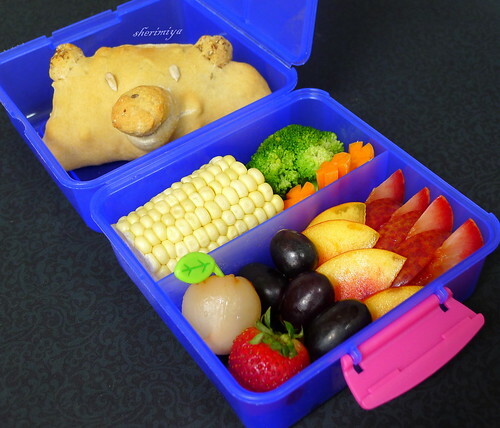 Who would expect to see a little piggy in a lunch box! SUPER LIKE! Omg Jenn, that sounds SO good. I am definitely going to try that. Why not mascarpone in calzone??!! Perfect! Thanks a lot Xelia, Jenn, Ꮮуռ էяɨռɨא (ᵐᵋˢˢᵞ ᴻ ᶜʱᵋᵋᵏᵞ) and Nami!! Little piggies are not easy for me. But they are cute, so I should practice!